If Paul Valery was right and “poems are never finished—just abandoned” then what each reader brings to the table is as important as the poet’s contribution. 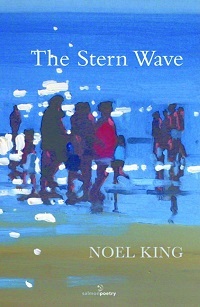 The Stern Wave’s blurb says that King “plays with our sense of environmental conscience” but after a first read-through if asked I’d have said, “This is all about family.” It’s actually somewhat broader than that; it’s about interrelationships, social interactions. The blurb also says that King “takes on many personas” which he does and many of them are familial: “granny always said”, “my uncle’s cattle”, “helping his father”, “I met my wife”, “her toddler takes a pee”, “mother’s 75th birthday beckons”. Often they connect in run-of-the-mill ways; poetry mined from day-to-day mundanity. Hard not to think of Larkin. By the fourth poem, ‘Mummies’, which is set in 1974, I found myself conjuring up a world I was comfortable with; I definitely look back on the seventies through rose-tinted glasses. There’s a poignancy here as well as a suffusion of nostalgia or perhaps that’s me; hard to tell. Suffice to say these poems ache. Noel King was born and lives in Tralee, Ireland so, unsurprisingly, certain cultural references escaped me: I had to google “GAA” (Gaelic Athletic Association) and “go hálainn” (beautifully) but I got the gist just fine. Poems like ‘Man on a Tractor in County Laois’ inevitably remind one of a young Heaney. she no longer saw herself in. On one level it’s obvious what’s happened. Then you wonder if you read it right. Maybe it’s not as straightforward as you first thought—maybe the ring’s like a boxing ring; maybe her husband punched her—and then it dawns on you. There’s much pain in these poems—a child clamours for attention, a husband can’t face his wife, a mistress feels for her lover’s wife, an adulteress hangs herself but only after she’s washed a clean frock to be buried in—but it’s leavened with wry, tongue-in-cheek humour. If a tree fell in the forest and there was no one there to commemorate it would there be any poetry? For all Nature tries to assert herself in this collection (mainly through water), the poetry clings to people for dear life. And it’s them you’ll remember. You can read five of his poems here and hear him recite another here.